Magnetic Couplings | Magnetic Drive Pumps | Magnetic Technologies Ltd. 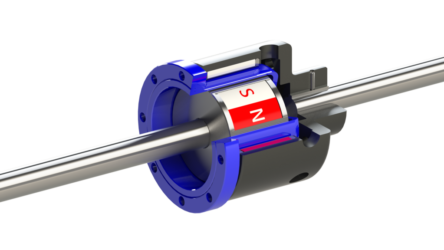 Magnetic couplings offer a non-contact transfer of torque. They are typically used in magnetic drive pumps and magnetic mixers for seal-less applications; keeping corrosive, toxic, or flammable liquids from escaping into the atmosphere. By driving one magnetic hub, torque is transmitted magnetically to the other magnetic hub. This can be done through the air or through a non-magnetic containment barrier such as stainless steel or fiberglass, allowing complete isolation of the inner magnetic hub from the outer magnetic hub. There are no contacting parts in magnetic drive pumps which allows for torque transmission through both angular and parallel misalignment. 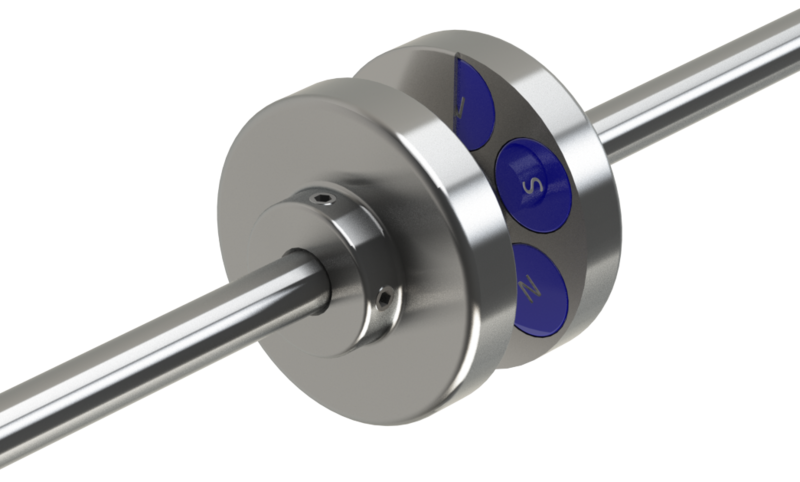 Disc type magnetic couplings consist of two opposing discs with powerful rare earth magnets. The torque applied to one disc is transferred through an air gap to the other disc. 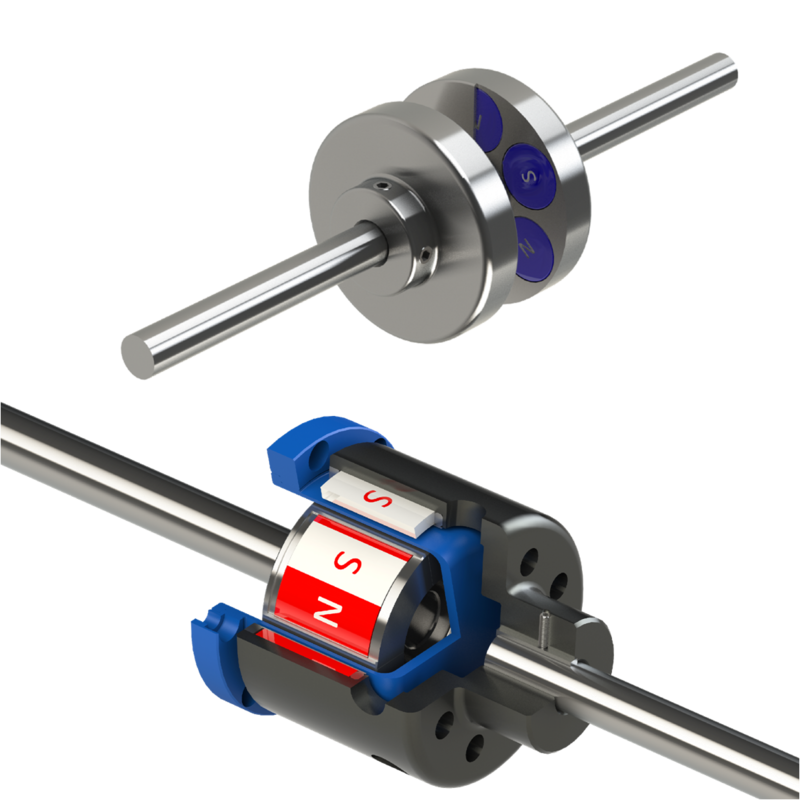 Because of its simple flat design, you can have angular misalignment of up to 3º or parallel misalignment up to ¼” and still transmit nearly full rotational torque. You could also fabricate an inexpensive flat barrier to separate the atmospheres or fluids surrounding the two discs. This is our simplest and most versatile coupling. Typical applications include magnetic mixers and magnetic drive pumps. The co-axial coupling consists of three parts, the inner hub, the outer hub, and the optional containment barrier. Both the inner and outer hubs consist of a series of rare earth magnets that are ground, potted, and glued to steel hubs. The inner hub is then completely sealed in stainless steel to protect the magnets and hub from damage or corrosive substances. These couplings are ideal for applications such as magnetic mixers, in which the “driven” hub is physically separated and sealed from the “driver” hub. Magnetic mixers are particularly well suited to applications that involve highly toxic or corrosive chemicals. MTC-0.1-SB through MTC-10-SB containment barriers are made from 316 stainless, and are rated to a minimum of 450 psi. Containment shells for other sizes are made to order and are rated according to customer requirements.